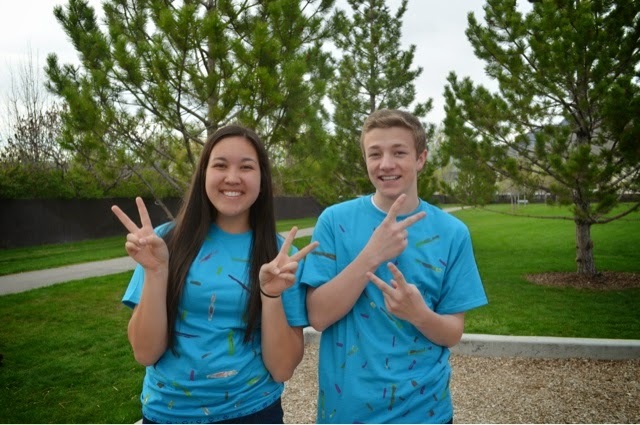 Kiana Bates: PG morp say what? I go to AF but I went to PG morp, so come at me. Holla at mixing schools! Jk I went because I live in pg and I went to pg junior high and all my ward friends were going and I think I still have friends over there. I've realized since this dance extravaganza that I need to know some high quality dance moves. I struggle a little but I can jump pretty well, so I guess that's a start. I kind of follow what everyone else is doing and I can never think of new moves to do which is tooootally lame. Anyway, back to morp. 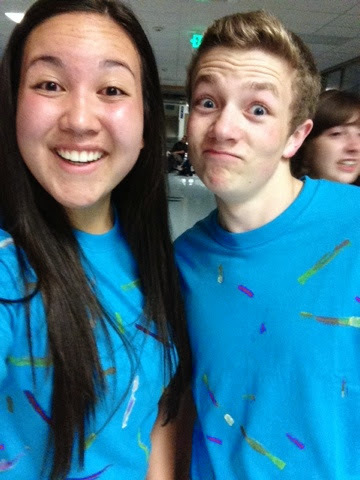 So me and this kid knew each other from our junior high days in band class together. And he golfs, so that's a win. It was kind of a spur of the movement type deal to ask him, but it ended up being fun! We made shirts, played at the park, ate pizza, danced, and went star tipping. As a group, we used 3 cans of whipped cream by squirting it on out hands, popping it into the air and trying to catch it in our mouths.